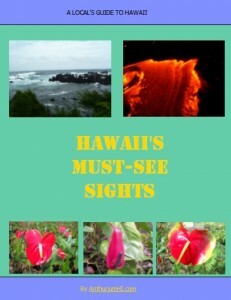 If you want to make sure that you don’t miss out on seeing Hawaii’s most spectacular sights, things that only locals know about, then you might want to enter your email below to get my free report on Hawaii’s Must-See Sights. I’ve lived in Hawaii for many decades. My parents were born here. Several of my grandparents were born here as well. So my family and I have spent a lot of time exploring every nook and cranny of the Big Island and I’ve put this knowledge into Hawaii’s Must-See Sights.